Bullet is an open-source physics engine which was integrated with the release of Poser 10 and Poser Pro 2014. It allows us to use soft and rigid body dynamics in our scenes. Rigid bodies are solid objects that do not deform when they collide with other objects. Think of bowling pins that are hit by a ball. Soft bodies on the other hand deform upon impact, like cloth or rubber. I had always assumed that Bullet Physics has something to do with projectiles being fired from guns, perhaps for use in game engines. Turns out that it’s just the name of the engine itself, which is also part of many other 3D applications like Blender. Here’s a quick overview on how to use this thing in Poser. First we need to show the palette that has all the goodies. Bullet Physics doesn’t have a dedicated room, so we’ll stay in the Pose Room for now. Head over to Window and select Bullet Physics Control. Feel free to dock the palette anywhere you like. You’ll see something like this. With a few test objects in your scene, click the New button in that palette to create a new simulation. You can have multiple simulations in your scene at the same time. Give it a funky title and see all the options in our palette come to life. The engine will need to run an animation, the duration of which can be set using start and end frames. This doesn’t mean you’re going to render an animation, it’s just the amount of frames it takes to calculate the desired effect between your objects. Under Objects we need to specify which of our 3D objects will participate in the physics calculation. Under Choreographed, select the objects that your soft bodies will collide against. In my case, I have the ground and an upside down bowl. These should remain solid. I’ll drape a cloth over the bowl. It’s the Hi-Res Square primitive from the Poser primitives library. Such objects need to have enough vertices for the effect to look good: a simple place with four vertices won’t have enough bendability (in fact, it will have none whatsoever). 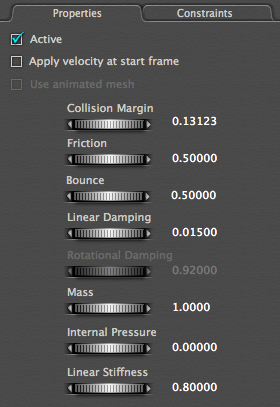 My cloth is a soft body object, so I’ll select it in the Soft Dynamics tab. Not every object in the scene needs to be selected in either of these tabs. For example, if the walls of a room never interact with your physics objects, there’s no need to select them. All unselected objects will be ignored, and physics objects will pass right through them. Now we can select to calculate our simulation, or use live simulation instead. Both have their advantages. 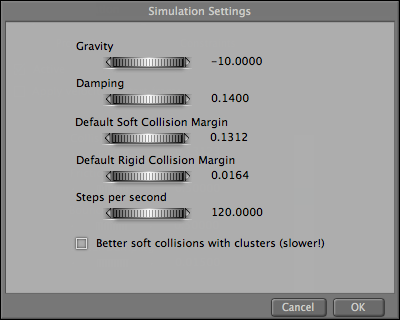 Select Calculate Simulation and Poser will render the amount of specified frames, then reset the scene. Use the timeline slider to move to a desired frame. This is nice for accurate results, and to “freeze time” at any point you like. It also allows you to move objects after they have been simulated. Note that your animation duration must match your simulation duration, otherwise you won’t see past frame 30 (the default Poser animation duration). If you select Live Simulation instead, the engine will calculate the effects in real time and keep doing so until you untick the box. This is helpful if you want to adjust objects and see the effect of your physics in real time. To reset the scene, select Clear Animation. Under the Properties tab you can tweak the physical properties of your objects. 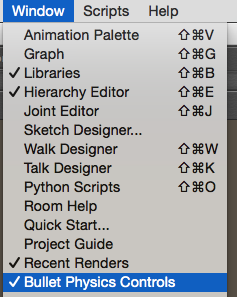 I’d like to see a little drop down menu here that could provide some defaults, much like Marvelous Designer does. To affect the general properties of the engine, such as gravity, choose Settings. Note that you need to recalculate your physics if you change any of these. 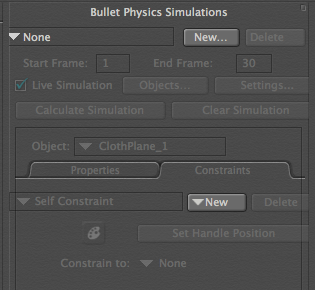 You can do a lot with Bullet Physics: paint constraints onto your objects so that only certain areas are affected by the simulation, set control points to move simulated objects, and mix in keyframe animations and other forces. The Poser Manual explains every parameter in more detail (page 524 onwards).